I recently got a chance to try out the Yuba Mundo “ one of a crop of integrated frame long tail cargo bikes that have been making their way to market in the last year or so. The Mundo falls at the low end of the price spectrum, and promises: cargo hauling capabilities ready to take on the challenges around the world. First impressions count, and mine were: Big, Blue, Cushy. The bike’s big: A typical length for a cargo bike, but the integrated horizontal stabilizers (h-racks) gives it an even larger appearance than most of the integrated cargo bikes. The all steel frame make the weight big too: the bare bike weighs in at about 60 lbs. 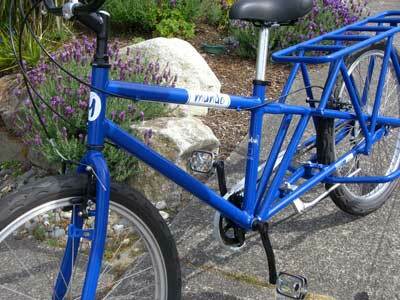 The bike comes in 2 colors: single-speed red and 6 speed blue. The paint’s nice, bright, deep looking and blue. With all that real-estate to cover you get a lotta lotta blue. But the biggest impression was the ride: Cushy. The gel based, sprung serfas saddle is good for the plain-clothed cyclists: it accommodates a variety of riders. The extra-long-wheelbase of the Mundo’s steel frame undoubtedly contributes to the cush. The huge tires (26” at the rim, but at 2 inches thick these are more like the size of a 29re tire) add ample pneumatic suspension to the overall package. My tires came inflated to sub-20 lbs: huge contact patch, plenty of spring but still enough air to handle heavy loads and rough roads (no pinch flats here, even after going up and down a few curbs fully loaded). Cruiser style controls and posture add to a relaxed feel for the bike. I must admit, it’s too much for me, I prefer a bit more ‘road feel’ to my rides. Surprisingly the handling of the bike is pretty much spot on, it seems like Yuba spent some time working on the right fork for the long wheelbase, loaded cargo bike extra wide frame form factor they’ve got. Loaded and unloaded this bike when where I wanted it to when I asked it. The design choices for the bike reflect it’s world-ready mission. Rather than complicated components this bike has the simple stuff. Threaded stem, 6 speeds w/ a simple long cage derailure, v-brakes and 26 inch Schrader tubes. The stuff you can find (and fix) anywhere in the world. The benefits here are a low price point and easy repair. I was disappointed by the lack of reliability some of these components had however “ my handlebars lost their grip on the stem, causing an unexpected and very painful dismount as my foot slipped off one of the pedals. I derailed the chain off the front chain ring heading up a hill (and had to remove the chain guard to get it back on, kind of a pain), and had unreliable shifting under all conditions. Probably these are transient problems that could be fixed with just a bit of tuning but auto-shifting with 150 lbs of living cargo on the back can be a bit scary. I was also surprised to find the 48 spoke rims were noticeably out of true, and the rim seams were already bending in making the brake click annoyingly when applied to both the front and rear tires. Cargo wise, the Mundo performed well. I have an xTracycle of my own, so I know how to load it down, and when the wife and I got a chance to head out for a few moments together we got ourselves on the Mundo and headed to town. We came back with $100 of groceries and goodies, plus the wife riding on the rack. She loved it and aside from the occasional auto-shift I had no trouble at all. The H-racks let me secure the grocery backs right on the rack (with a little help from a bungee cord) and provided bottom up support. I used an old inner tube to strap a 5 gallon bucket to one side and we kept our odds and ends in there. I strapped an inflatable stadium cushion to the top of the rack for a seat for the misses and she had no complaints. A set of stoker stems would have been good, but having your passenger hold firm to your waste wasn’t half bad either. I do miss the bags that came with my xtracycle, and the Mundo seems much more DIY in this area than what I’m used to. It’s set up very well for hauling large, strappable loads, but a collection of small things is more problematic without bags of some sort. The Mundo site emphasizes how many containers you can mount on the Mundo, and I have to agree it’s straight forward to do, but it still needs done. Same for a ‘deck’, easy to do but still needs done. My 6 year old had a fantastic (if frightening for me) time sticking her finger on the moving tire through the ladder style rack top. The ladder style rack is one of the best parts, though. Finally, a long tail cargo bike I can pick up and carry around. I have stairs, and being able to get a balanced grip on a bike is a huge advantage, especially given the girth of the Mundo. The frame’s got amenities to spare. Fender eyelets, light mounts, even something up front I’ve never seen before (license plate holder?). I was a bit disappointed to not see a dedicated set of eyelets for front basket, most folks I know who run xTracycles have a bit of cargo space up front too, but this problem is easily overcome with a bit of ingenuity. The Yuba’s a capable cargo bike for a great price. Most of the nits I have to pick could be solved with a bit of elbow grease, tuning or creativity. I’m not sure this is the bike I’d pick for a long distance tour, but for garden variety short haul grocery getting, ferrying around the significant other, or hauling your farm goods to market I this looks like a great bike. We’ve had the Mundo for a few months and it’s been discussed in other posts. Byron thought that it was under-spec’d for the US market with the biggest omission being the lack of disc brake mounts, gearing for hilly terrain, and also noted that he thought it could transport a freezer. We’re also concerned that shop mechanics are going to struggle with the setup of the bike and that may hurt sales – it’s very difficult to assemble the H-rack. Also note we’ve got an early factory sample and Yuba has been hard at work making improvements in follow-on bikes. Choice, competition, and options are good and having another offering in the cargo niche is good. Mundos are available from your local bike shop and Rock the Bike. Finally, this Fall we’re giving this bike away. More on that in a follow-on post.